Are you looking for an excellent alternative to a hotel room? Look no further!! This is an immaculate, tastefully designed single story home. Welcome to your private ''Vacation Home''. Everything is provided, just bring your clothes. Indulge yourself in a entirely different Las Vegas experience. All- inclusive short term housing. Long term rates are also available. Perfect for group travelers. Combine work and play, add a vacation to business meetings, seminars and conventions. Ideal for corporate use. Swim in your refreshing private pool, relax in your personal hot tub. No overlooking. Escape to your relaxing, single story home. Ideal for celebration events and perfect for bringing a family together of all ages. No detail overlooked to make your stay comfortable. Monitored alarm system, pool service, gardener. Complimentary wireless internet. Easy access to World Market Center events, great for poker officials and players. The hustle and bustle of the Las Vegas Strip is only 18 minutes away, a mere 30 minutes drive from the airport. Retail therapy at a large outlet shopping mall is very nearby for a change of pace. Top class golfing is so close, Vegas offers so much more than you imagined. Enjoy fun in the sun, or you make the choice of what you want to explore each day. Las Vegas is awaiting you, and so is ''your home''! My home offers you all that you were hoping to find. **3 night minimum stay required, however, if renting 6 months in advance, more nights MAY be required in order to make a confirmed reservation. Reservations past January 2019 are not yet being considered. 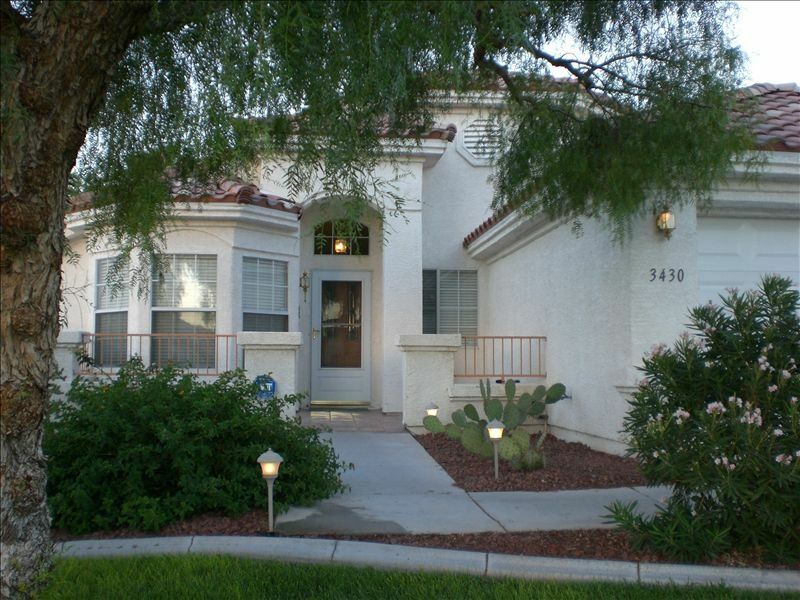 We are very devoted to making your Las Vegas home the best possible experience. Las Vegas has always been a great escape from the rain, cold, and cloudy skies. We have always loved the weather and the excitement of the Strip but we found that there is 'overload' when we stayed at a Casino Hotel, too much noise, smokey, and no where to escape to, except a one room hotel. We are not 'spring chickens' so Casino pools were not our cup of tea. SO...why not buy a vacation home for us to enjoy and share with the many travellers who love the hustle and bustle of the Strip, but in increments. Private home, cook our normal meals, swim, sunbath...no noise, no lookyloos, all the comforts of home in the sun. THEN, get in the car and in 18 minutes you have all the excitement that Vegas holds. Ahhhh...the best of both worlds. Bathrooms are fully stocked with the supplies that you will need. Toilet paper, bath soap, hand soap, shampoo, towels, blow dryers, curling irons, cleaning supplies. My home is located 15-18 minutes from the Strip. Local telephone calls only, no long distance. You are able to set the temperature to your personal comfort level. For your added convenience ceiling fans are in all rooms. Supply of linens including pool towels. Bedding provided for additional mattress that can be set up. Laundry area just off the bedrooms for your convenience. Also included iron and ironing board. Dryer just off the bedroom area and outdoor dryer rack for swimsuits and pool towels. Garage with automatic remote garage door opener. TV'S are provided in all bedrooms and family room. Large covered patior, multiple outdoor furniture configurations. Swim in your private secluded outdoor in ground pool. No one overlooking. Additional fee for pool heating ($30.00 for 12 hours of use) not necessarily continuous hours. Great place close to downtown. Bev is very nice. The only thing is heating the pool takes a while but it’s worth the wait. Will stay with you again thanks. The home is fantastic. There has been a lot of thought put into what is available for guests. My family of five was exceptionally comfortable and enjoyed our stay. Overall it was a nice place with the exception of a couple minor items: The neighbor’s dog barks a lot, all the time and the house rules asked that the guest renters be quiet and respectful because the rest of the neighbors are not on vacation, neither is the dog. The beds at least the one I sept in can use an upgrade I can’t speak for the rest of them. The two cup coffee pot has to go. For a house designed for a larger group you really need to upgrade to 10 cupper at least. The house was well stocked with most of what you may need. As I started with Overall with the exception of the couple minor items it was a nice place for sure. The neighborhood it is in is decent for sure, but not on the higher end for sure. The renters/landlord try to keep up the yard appearance up, I would ask to get rid of the landscaping broke ground lamps and the cords sticking out of the ground they are trip hazards for sure. My 79 year old mom trip over one of them. Well stocked rental, everything you need and then some. Bev was very attentive and quick to respond anytime we had a question or issue. Highly.recommend this rental!